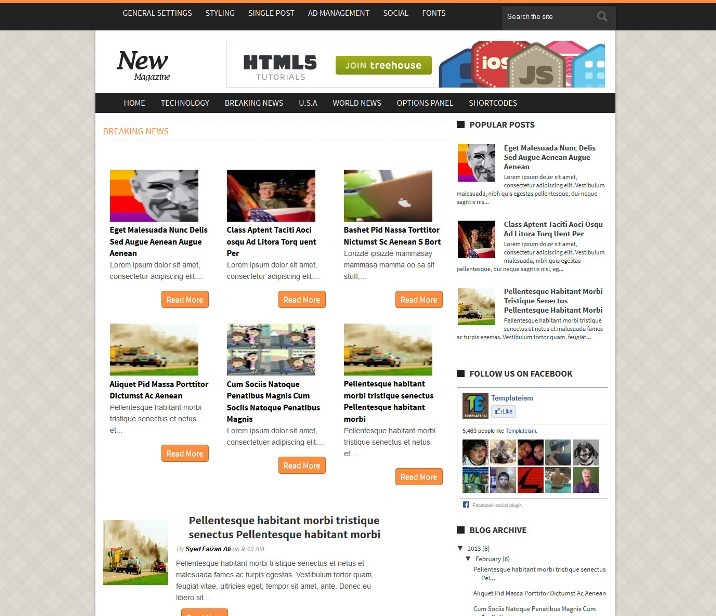 News Magazine is an ever new responsive Template for Blogger Platform. Though, this template has the capability to take shape of any kind of website, but it is ideal for the Niche blogging like Technology, News bulletin, Gadgets, Telecom. 1 Sidebar, 2 Columns, Adapted from WordPress, Brown, Elegant, Fixed width, Fresh, Green, Magazine, Right Sidebar, Top Navigation Bar and more. 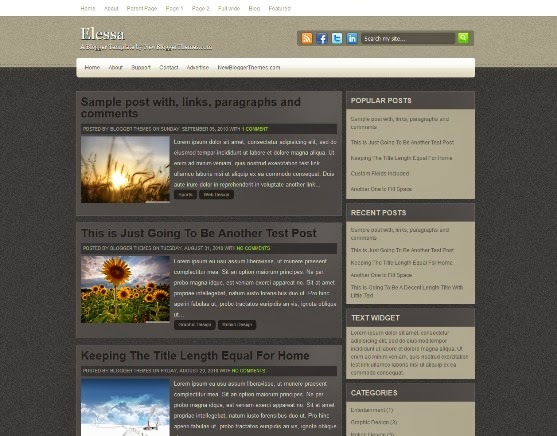 Black Beauty template is a free magazine style blogger template for any content blog. Features are Magazine style blogger template with green color, Navigation dropdown menu, 3 column blogger template with right sidebar and more. 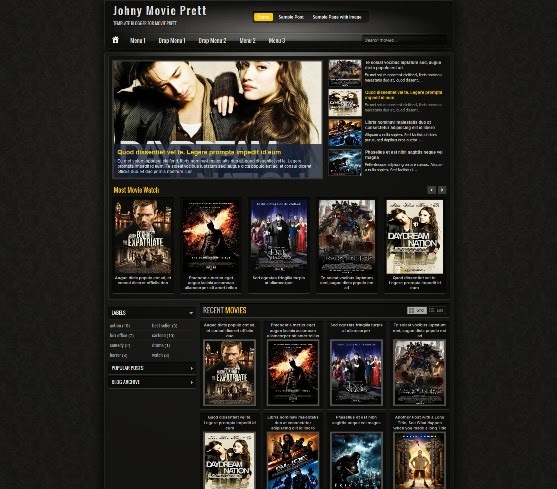 This is a gallery template blogger for your movie content, named Johny Movie Prett with the dark style color black and orange. This template was designed for gallery content blogger especially for your movie collection. This template suitable for gallery content blog with daily updates. 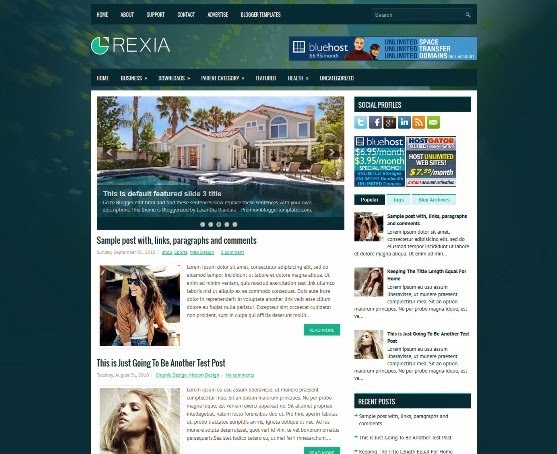 “Rexia” is a free blogger template for Magazine. Features are 1 Sidebar, 2 Column, 3 Column footer, Adapted from WordPress, Elegant, Featured Section, Fixed width and Header Banner. 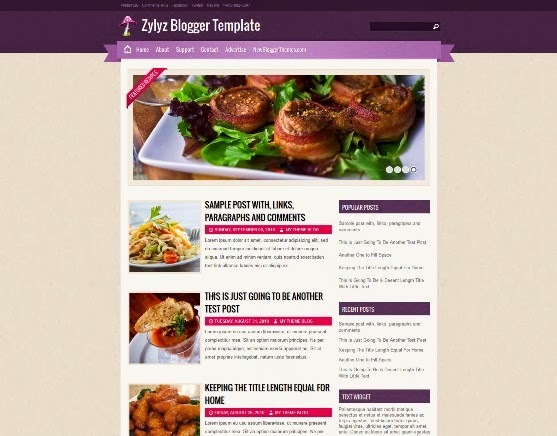 Zylyz is a free blogger template for Recipe Magazine. Features are 1 Sidebar, 2 Columns, 3 Column Footer, Adapted from WordPress, Elegant, Featured Section, Fixed width, Fresh, Purple, Red, Right Sidebar, Slider, Top Navigation Bar and more. 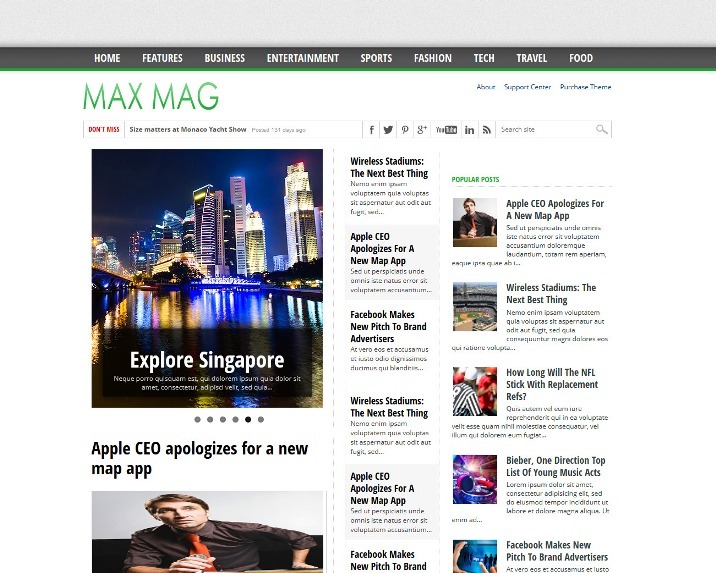 Max Mag is a featured-rich, multimedia and magazine theme. Max Mag is a fully responsive template that has unlimited color scheme with a “Sticky” Menu that scrolls throughout the site. 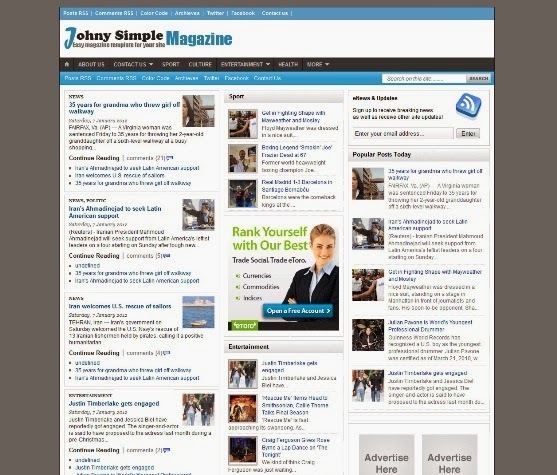 Johny Simple Magazine Blogger Template is magazine design blogger templates with 3 columns layout and 2 right sidebar for basic layout, small feature post, black color and very professional magazine themes, minimalist design make this themes fast on browser, have good position ads for make money and you can try this themes for magazine or news sites. 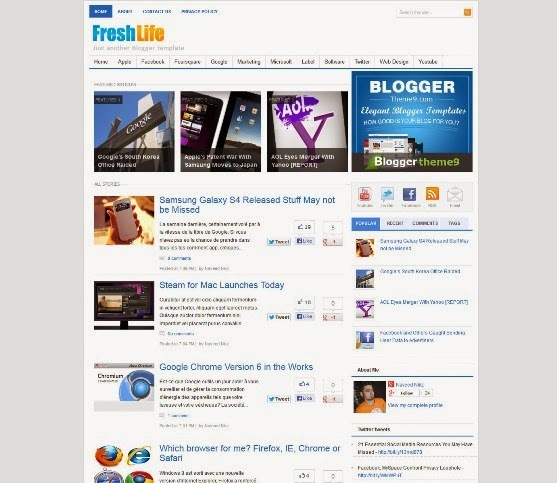 You may enjoy ‘freshlife blogger theme’ for free. Its features are simply amazing with new animated navigation bar, usage of gradient colors and awesome strokes. Can be used by all sorts of bloggers such as wallpapers, fashion, news, gossips, magazine etc. 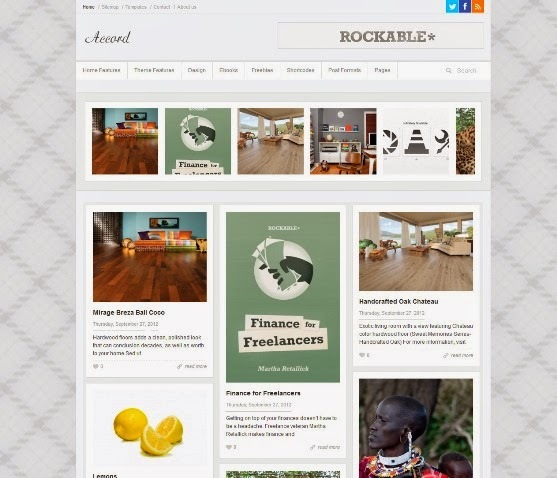 Accord is a free blogger template for Fashion. Template features : Pinterest Look, 3 Columns, Right Sidebar, Featured Post Slider, Fixed Width, Gray Background, Social Widget, Header Banner, Dropdown Menu and Page Navigation Widget.